Alternattiva Demokratika MEP candidates Mina Tolu and Carmel Cacopardo have signed the ILGA-Europe Come Out pledge to stand for the human rights and equality for all lesbian, gay, bisexual, trans, and intersex (LGBTI) people in the EU and beyond. 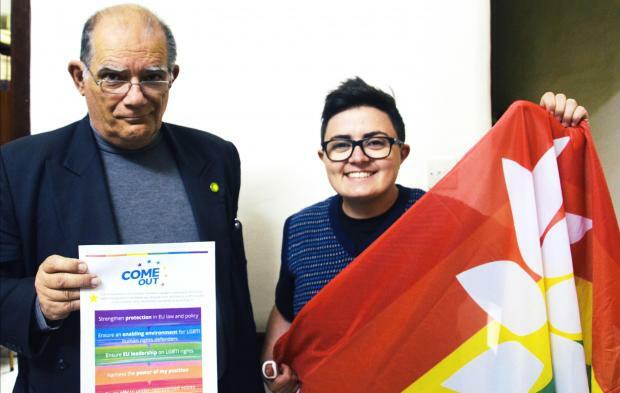 Ms Tolu, an LGBTQI activist, said she remembered reaching out to MEP candidates in Malta, including Mr Cacopardo, five years ago to sign ILGA-Europe's 2014 Pledge. “This time, it is an honour to pledge my own support as a Green candidate. If elected I look forward to working together with LGBTQI activists to ensure the highest possible level of legal protection of the human rights of LGBTQI people in the EU and beyond." Mr Cacopardo promised to be an ally and to amplify the voices of LGBTQI people, not only if elected, but also in his role as AD chairman. The EU should champion human rights and offer protection and respect for all LGBTQI people, he said. Read more about the Come Out pledge.